The foods that you eat have an impact on the chemicals in your body, especially your blood. Sometimes, if the amount of sodium in your blood becomes imbalanced, it can lead to swelling of parts of your body, particularly your feet. Excessive salt consumption can contribute to this problem, which may be relieved by cutting back on how much salt you consume in your diet. If your feet begin to swell, you may be suffering from a condition known as edema. Edema is caused by fluid getting trapped in the space between cells, also known as the extracellular space. This is most common in the extremities, particularly the ankles and feet, because gravity naturally pulls liquid down to these areas. Edema can cause the affected tracts of skin to look shiny and stretched, and pushing gently on the affected areas for 15 seconds can cause a visible dimple. Eating too much salt can result in mild cases of edema. When you eat too much salt, the amount of sodium in your body rises. Because abnormally high sodium concentrations can be dangerous, your body will hold onto more water in an attempt to dilute this excess sodium. The increased liquid volume causes small blood vessels, known as capillaries, to leak some of the excess fluid into the space between your cells, causing edema. According to the Centers for Disease Control and Prevention, adults should reduce daily sodium intake to 2,300 milligrams. If you are over 51 years old, are African American, have high blood pressure, diabetes or chronic kidney disease, you should aim for no more than 1,500 milligrams of sodium per day. Although swollen feet may not seem like a serious medical problem, edema can cause a number of different complications. For one thing, the swelling can become painful and result in the joints in the feet becoming stiff, making it difficult to walk. The swollen parts of the body are also at risk of developing infection. Prolonged edema can also result in scarring and a loss of elasticity in the blood vessels, muscles and joints. Edema can also cause ulcers to form and poor circulation. If you have a high daily sodium intake and develop swelling in your feet, your doctor may tell you to decrease your salt consumption. You may also benefit from wearing special socks and hosiery known as support stockings and by elevating your legs when possible to help the fluid drain out of the extracellular space. Diuretics may also be prescribed to help you eliminate some of the excess fluid in your body, though they may not be appropriate for pregnant women. The sodium content of foods you commonly eat may surprise you. Check the nutrition label on your bread. The American Heart Association explains that, while sodium content varies among brands, one slice of bread can contain between 230 to 1,000 milligrams of salt. Make a sandwich with cold cuts or cured meats, which contain about 1,050 milligrams, add a slice of Swiss cheese for 55 milligrams of sodium per ounce, and you are consuming a couple of days worth of sodium. Other commonly eaten foods with high levels of sodium include pizza, with about 760 milligrams per slice. Four chicken nuggets contain about 360 milligrams, add 1 ounce of honey mustard dipping sauce for 180 milligrams and your snack adds up to 540 milligrams of sodium. One microwavable cup of chicken noodle soup has about 890 milligram of ankle-swelling sodium. 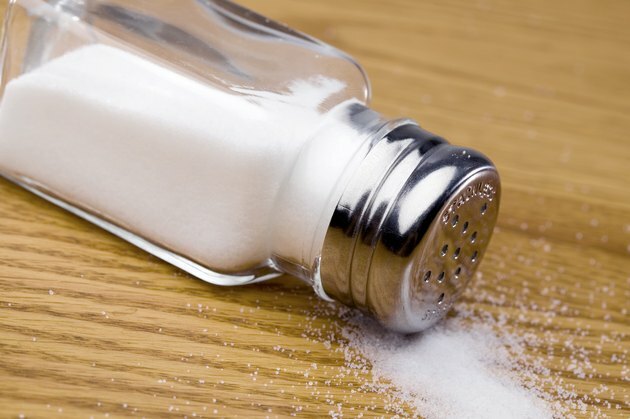 American Heart Association: The Salty Six: Are the Foods You Eat Most Often High in Sodium?